Having a blog, creating powerpoint presentations, adding pictures to your applications and so on. Regularly i am up to the challenge to edit some pictures i need for work. I don’t like spending hours editting images with photoshop or some other software package i have to study before i get the minimal result i am looking for. In the early days i’ve used SnagIt on a regular base. 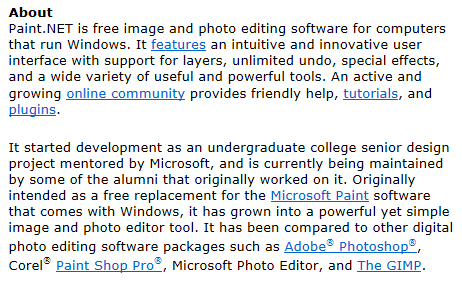 This all changed when Windows Vista gave me “Snipping Tool”. This is such a perfect little program embedded just in your operating system. But you now how it goes right? Every app just does that what it is good for. But sometimes i want just that little more. Take the next scenario: you have a picture and clipped it just the way you want it. Now all i need to do is to “blur” the contents just a little because of copyright or some other reason. The standard Paint app from Microsoft is a great tool but something like ‘blurring’ is not an option. Now should i install some mega application just to blur my picture? No you don’t have to. I stumbled upon this app called “Paint.Net” and added it to my toolbox. This is one of those jewels you will use for ever. Small, easy to use and free. Yes you’ve read it, it’s free. They take donations so if you think they deserve it donate some with PayPal. Website: ofcourse it is much easier to refer to the website where you can download this amazing app! Have a look at the screenshots there. Download it now and start using it. This should be in your toolbox!! This entry was posted in Toolbox and tagged Blurring tool, Edit pictures, Paint, Paint.Net on February 29, 2012 by Maurice.